IT'S TOFFEE'S TURN: BN without BN. What's up? There seems to be sudden withdrawal, a lull, a complete silence and an absence from the public eye, I am talking about the much talked about woman, the woman who used to hog the limelight is missing , yes I am talking about Bini Najib (BN) why has she not hit campaign trail and given speeches and seen on stage together with Najib? After all the press coverage both here and abroad that she received whilst her husband was the longest serving Prime Minster without the peoples mandate it seems that her PR people have not foudn it wise to have her as one of the BN speakers, especially now that Sahahrizat, her deputy and Rafidah are all missing the PM's wife may have made an impact with women especially rural women, and I dare to say, not in jest that she would have made a huge impact with the Malays. Najib as usual has gone back on his word, looks like he will say anything at the spur of the moment, did he not give the private sector a quota for female managers? Now if you look at the BN line up there are so few women I wonder how the wanita can accept it. One brave woman their deputy dared to go it alone and that is what is expected of her as a leader of the women's wing in the country's most dominant political party. It is really looking like UMNO only pays lip service to the importance of women in society. Aren't you lonesome tonight sir? Rosmah was everywhere hogging the limelight as Malaysia's "First Lady, " she was all over the place flouting her expensive handbags, ordering expensive clothes "examining" according to her a multi million dollar diamond ring, there was hardly a day when the government controlled print media missed Rosmah but now at the time when the BN requires her most and especially the presence of a woman, BN is missing, I mean Bini Najib is missing and what ever happend to our "First Lady." When the American President hits the campaign trail, not only his wife but his children follow him because the institiution of the family is something so important and so his first and most ardent supporter has to be his wife and she has to show that support publicly, but that does not seem to be the case with Rosmah,or is it Najib, isn't Najib missing her charm? Why aren't the UMNO people especially the wanita not crying out for her? Well one thing for certain even if wanita UMNO does not miss her other Malaysian's are missing her, everywhere you go to the Pakatan ceramahs they talk about he, about how she uses the presents that have been presented to her for the people of Malaysia on her visits abroad by the heads of state, Presidents and Prime Ministers. 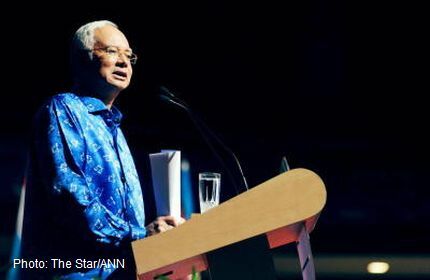 Is Najib waiting to bring Rosmah out as his last card in the campaign trail, she could do the State of the Nation speech, she hold s PhD, and surely the "First Lady" will add more grace, charm and attraction to Najib's campaign, she has been around at other national functions so where is our "First Lady" now. If Najib brings her on the campaign trail I think all National Television stations should carry the event live for the benefit of the people , they need to listen to her to what she has to say, after all she is our "first lady." There must be another woman speaker before her and now since the head and the deputy are absent, this blog would like to suggest the Listen, Listen, Listen lady, after all she is also UMNO, wonder why Najib did not field her at least. Whilst discussing this at the Eastin Hotel with some UMNO boys I commented, "but then Mahathir's wife never followed him on the campaign trail, she never hogged the limelight so why now Rosmah, why should she deserve it?" to which one of them replied, "but Siti Hasmah never claimed to be first lady, and the only time we saw her was at the Badminton matches, even if she accompanied Mahathir she always kept a very low profile sometimes you do not even notice she is there, she never wanted to really play that role, but come on man you know Rosmah bet she is dying to be there, so she needs to be there or people may even think something is wrong "
So now we have a BN campaign in full swing without BN.